Just because the shipping is FREE doesn't mean it should take a long time to arrive. BibleToys.com understands that getting your items quickly is important to you, so we make every effort to process your order quickly. When you select FREE Shipping from our website, your order will ship via GROUND service (FedEx Ground) and we will email you a tracking number so that you can track your order from beginning to end. You can expect to receive your order within 5 business days AFTER your order has shipped. Most orders ship within 24 hours; however if your order includes an out-of-stock item, it may take 1-2 weeks before we get the out-of-stock item back in stock from our supplier. Once we have received all of the out-of-stock items, we will ship your entire order to you. If you would like a partial shipment of the in-stock items, please let us know by phone or visit our contact us page. Also please note that we do not ship on weekends or holidays. If you are not 100% satisfied with your purchase, you can return your order to the warehouse for a full refund. All we ask is that you send the items back to us in their original condition. If for whatever reason you need to return your item, simply go through our easy return process outlined below. If your return consists of more than 10 items, there will be a restocking charge of 25% on the value of those items. Here's an example: Suppose you purchased 50 bears for $5 each and you need to return 25 bears >>> The value of your order was $250 and the value of the 25 bears you are returning is $125 >>> Therefore the restocking charge is 25% of $125 which is $31.25 >>> When we receive your return, your refund will be $125 minus $31.25 which is $93.75. Below is our easy return process. With BibleToys.com's 30 day return policy, there are no special catches or exceptions. All we ask is that you send the items back to us in their original condition. You can return your purchase for up to 30 days from the purchase date. Products must be in the condition you received them. To begin your return process, just complete a return request. Once your return is received and inspected by the fulfillment centers (usually within 72 hours of receipt), your refund will be processed and a credit will be automatically applied to your credit card or original method of payment within 7 days. Please note that depending on your credit card company, it may take an additional 2-10 business days after your credit is applied for it to post to your account. In Store Pickup is Free. We are located in Newhall, CA. Our address is 24625 Railroad Ave., Newhall, CA 91321. Once your order is ready, we will contact you by email. We will also let you know when we are OPEN for pickup. BibleToys.com ships with FedEx. When you select GROUND service, we will email you a tracking number so that you can track your order from beginning to end. You can expect to receive your order within 5 business days AFTER your order has shipped. Most orders ship within 24 hours; however if your order includes an out-of-stock item, it may take 1-2 weeks before we get the out-of-stock item back in stock from our supplier. Once we have received all of the out-of-stock items, we will ship your entire order to you. If you would like a partial shipment of the in-stock items, please let us know by phone or visit our contact us page. Also please note that we do not ship on weekends or holidays. We understand that sometimes customers need a quicker delivery option than Ground. That's why we offer express shipping methods during checkout. 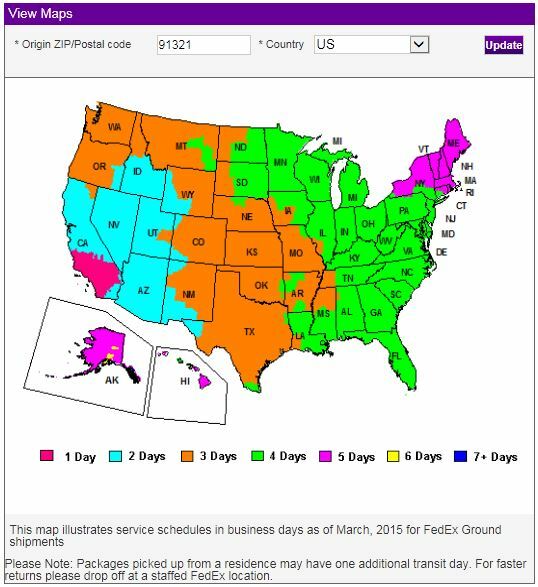 FedEx 2 Day, 3 Day and Next Day options are available during checkout. BibleToys.com ships with FedEx. When you select 2 Day, 3 Day and Next Day service, we will email you a tracking number so that you can track your order from beginning to end. Please keep in mind that the delivery days (ie: 2 days, 3 days, or next day) start counting AFTER your order has shipped. Most orders ship within 24 hours; however if your order includes an out-of-stock item, it may take 1-2 weeks before we get the out-of-stock item back in stock from our supplier. Once we have received all of the out-of-stock items, we will ship your entire order to you. If you would like a partial shipment of the in-stock items, please let us know by phone or visit our contact us page. Also please note that we do not ship on weekends or holidays. Generally, our FedEx pickup time is 2 PM PST on weekdays -- so if you place your order after 2 PM PST on a non-holiday weekday and you need a 2 Day, 3 Day or Next day service, please let us know so that we can make sure that your order ships out the same day. Either visit our contact us page or call us toll free at 1.888.317.9237 and we will do our best to get your order out on the same day. BibleToys.com has partnered with a trusted third-party company, International Checkout, to fulfill orders for our International customers. Simply put the items you wish to purchase in our Shopping Cart and choose the "International Checkout" option. Your items will be transferred to International Checkout for processing. You may pay by International credit card, PayPal or bank transfer. International Checkout will process your order, including billing, shipping and customer service. Once your order is completed, all inquiries should be directed to International Checkout at support@internationalcheckout.com. International shipping is currently available WORLDWIDE from BibleToys.com. Our third party vendor, International Checkout, will ship to all destinations around the world including APO / FPO addresses. If you're placing a large order and would like to use your own carrier, we can make arrangements to ship your order this way. Please visit our contact us page or call us toll free at 1.888.317.9237 to make arrangements before placing your order.